In Arctic white with blue cloth upholstery. 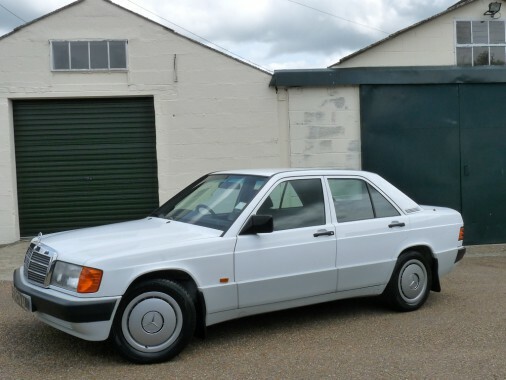 This outstanding 190E 1.8 was supplied new to a lady in St. Martins, Guernsey by Jacksons Mercedes with the options of a four speed automatic gearbox and factory manual steel sunroof. She kept the car until she could no longer drive with Jacksons maintaining it for her throughout her tenure. It then passed to her daughter who also used the car sparingly and Jacksons continued the servicing, the last one being carried out on 01/10/1013 at 10,703 miles. Needless to say the Mercedes is in outstanding condition. The boot looks unused, the engine bay is superb and, baring some small wear on the driver's overmat, the interior is as new. It has four new Continental tyres, fitted because of age rather than wear. The Mercedes is registered in the UK and comes with a V5 and a current MOT.